Find and compare the best prices from a range of well known car rental companies at Bydgoszcz Airport. This is a free to use facility, enabeling you to book direct with the company quoting the price. Bydzdgoszcz has one terminal, a modern building opened in 2004. 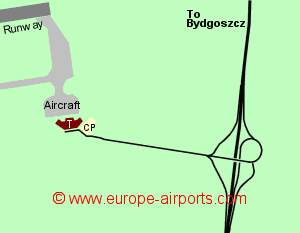 There is a regular scheduled bus service between the airport and Byzdgoszcz centre, where there is a train station. Facilities include 2 coffee bars, 4 shops and money change facilities, a post office, and FREE WiFi Internet access. 331,000 passengers used Bysdgoszcz airport in 2017, a drop of 2% compared to the previous years figures.